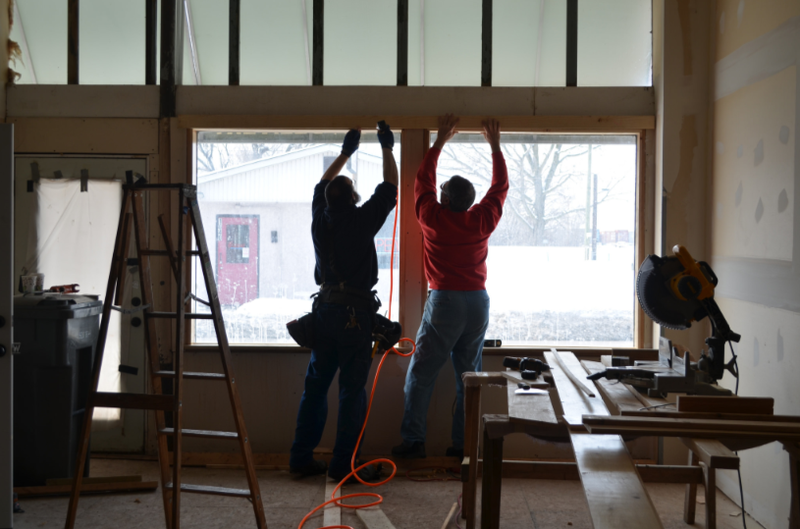 David Frank and Jim Ryan replace the trim around the front windows of the new meeting room in Indianapolis. The northern Virginia branch sent 23 workers to tackle projects in Indianapolis and Evansville in mid February. The trips built on a successful trip last year which drew 16 people to one location, the South Side of Indianapolis. 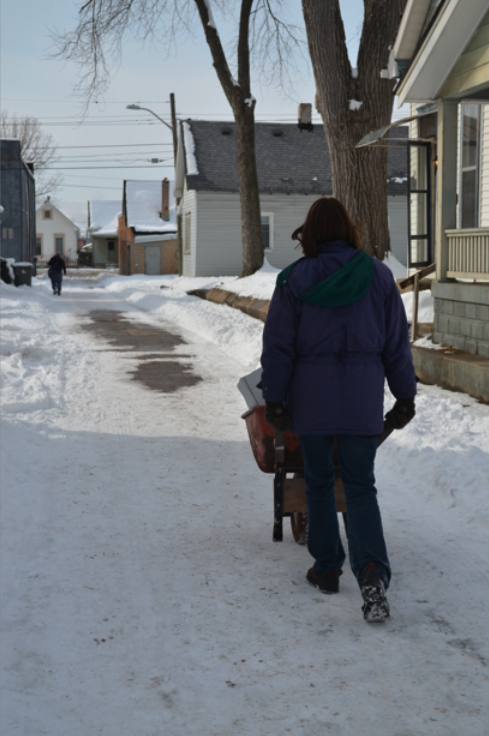 Margaret Crimmins uses a wheelbarrow to cart tools on the South Side of Indianapolis. In Indianapolis, much of the work focused on Cornerstone Commons at the corner of Meridian and Karcher. Some People of Praise members have purchased this 10,000-square-foot property, which includes eight apartments, a small office space, a warehouse, a launderette and a retail area. Margaret Crimmins worked at Cornerstone Commons and also set out into the neighborhood with Naomi Coney. They carried boxes down from an elderly neighbor's attic on Union Street so she could organize them, then moved her (small) piano for her. 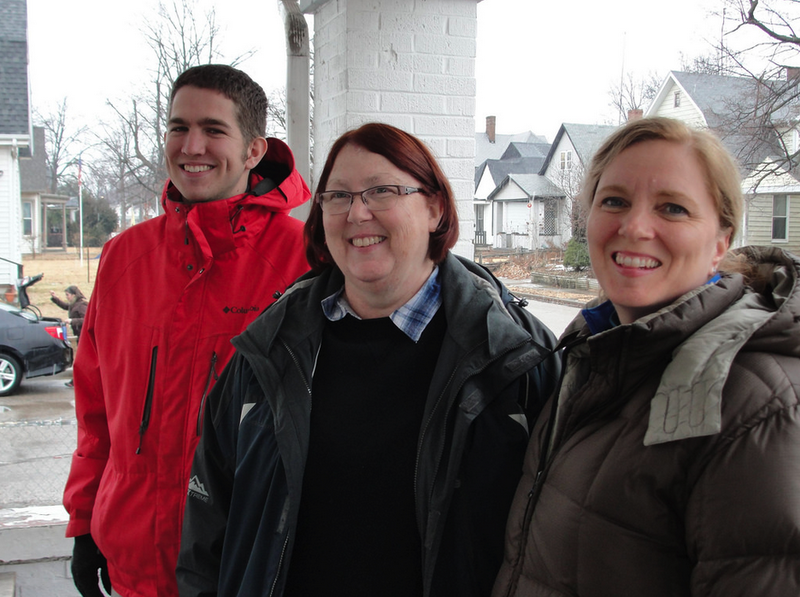 From left: Kevin McShane, Cathy Johnson and Chris Vieck in Evansville. Contact with People of Praise missionaries was a huge part of the experience in Evansville—and not just via eating lunch or supper together. For example, four people went out with the missionaries door to door. “I was impressed by the energy and dedication of these missionaries. 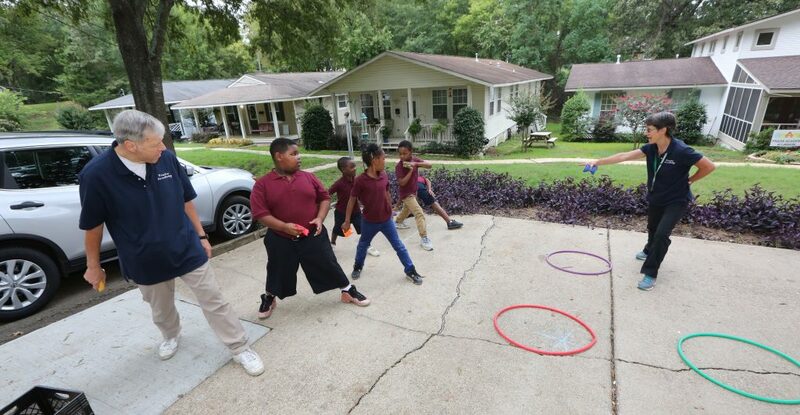 They are making a difference in the neighborhood,” Jim says. In addition to branch volunteers, Bill arranged for five men from outside the community to join the work crews—members of a monthly men's prayer breakfast that he organizes in northern Virginia. Pete Schunk working in Evansville. terrific job! Praise God for you all. I am praying for you daily in my intercessory prayer time. Love to hear about what's happening around POP. Way to go NOVA! Glad you went where the help was needed! We're so inspired by your example Bill & Carolyn! Don't let us be deterred by age! Let's not quit. Let' continue to support our missionaries and go where the Lord calls us to build his KIngdom! There are so many folks thirsting for the Lord right now! We're so inspired by all of you and are renewed in our efforts in Portland! We are united in the Holy Spirit! wow... you're all heros... hard work and in the freezing cold!.. we could never survive, even with hot meals and Walt's sizzling guitar... and Mary D a "cobwebs sweep"... the Lord looking down and dancing I'd guess! mind and heart can't help but draw others closer to Christ. I can only imagine the impact your presence and service had on the neighborhoods in which you worked. The work is a wonderful tool to bring the Lord to these children of His, young and old, who are hungering for experiential knowledge of Him. They actually were able to do that through the 'Christ in you". Praise God. Thank you NOVA, for giving your time and talents to further City Building. What a joy it is to join with the saints of God in this work. Truly "Light has come into the world ...so that it can be seen. " (Jn 3:19). You have spread that light. I'm overwhelmed by your love, your taking care of little items and large ones. Doing things you can do and doing things you have never done before. I'm reminded of the passage in Luke: ....love The Lord God with all your heart, with all your soul, with all your mind and all your strength and your neighbor as yourself. You have truly livrf this scripture. Thank you NOVA for your response to the needs here in Indy and down in Evansville. It was our pleasure to have you all here for a few days. Your willingness to lean into the work and the daily schedule was inspiring to all of us. 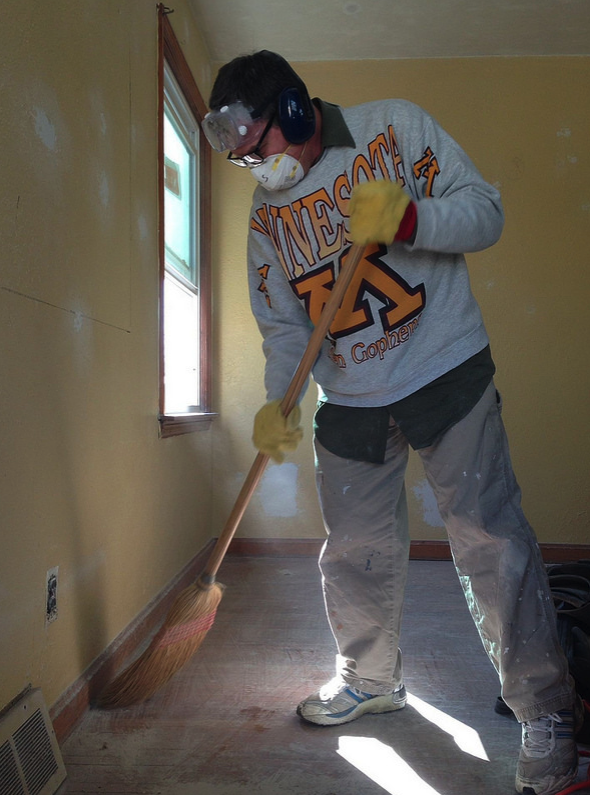 You've given us a big hand in getting the work started for Action Summer 2014! I only wish every story could have been told. While the Indiana Service Trip was a huge success...let's not forget the Missionaries in Evansville and the Christians in Mission, Campus Ministry, and Branch members in Indianapolis that are pouring our their lives every day in the most challenging of circumstances. Praise God! The unity of our body is such a mighty blessing. It is so true that we are all in this together! One work - One People of Praise - One God!